Shame they dont advise what collective, it doesnt need to be a secret as no one is going to try and circumvent the importer by trying to go direct to the coop...unless you actually happen to be there and buy 500 grams for personal consumption. Importation from these areas is too hard except for the very dedicated that want some kind of commercial quantity. I don't know, far from it, but maybe they don't think that sort of info would be of any interest to the general public like me. Just a guess of course and I could be way off . Currently drinking Colombia Finca Veracruz. I have in my hot little hands a pack from a MyCuppa of a Pony Express (if you don't subscribe to the MyCuppa Newsletter you're missing out... majorly) and a AA PNG that smells amazing (roaster's choice). Once again I am shocked at the value for money on offer by Jeff at MyCuppa. My family and I have been enjoying a magnificent coffee over the past few days. 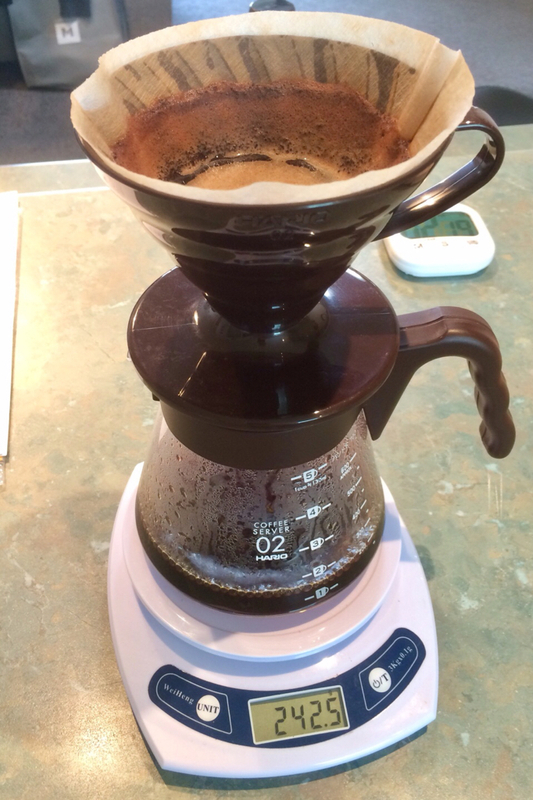 A Brazil Ipanema Yellow Bourbon microlot. A natural processed from Fazenda Rio Verde. Balanced acidity with a lasting aftertaste of mulberries, raspberries and turkish delight. A creamy body with a slight sweet milk chocolate finish in a milk based drink. As an espresso, or with milk, it has been praised by the increasing number of people who just happen to pop around. I had it as a flat white on Thursday morning before driving into Brisbane for a meeting. I could still taste it over an hour later. I joined my colleagues for a coffee (at a reputable venue), and was so disappointed with the coffee that was served. It did not compare. A pleasant reminder of the quality of coffee served at home. Yes!! I was sorry to miss yo yesterday mate but am really grateful for the bean delivery. They look and smell so fresh compared to other green bean offerings on other sites and if they're anywhere near as good as your last lot I'll be ecstatic! Whilst I'm letting my Harrar beans rest a little more, I only drank half the shots when I was trying to dial them in (so as not to overconsume XD), and chucked the rest in a cup in the fridge, just for fun and to see what they taste like in a few days. So as blasphemous as it is (and as I had no other coffee around), decided to boil the kettle, fill a cup, and pour equivalent of a double shot (cold, and about 40g worth) over the hot water, and drink it is a long black. Beats instant and certainly beats Nespresso! Just tried the washed Kenya AA beans at day 9 post-roast as an espresso... wwwowza haha, incredible. Even from a complete guesstimate of what grind/dose for a first shot! A 50/50 blend of Colombia ASPRO Timana and Monsoon Malabar made for a very tasty espresso yesterday. im drinking an Ecuador Hakuna Matata single estate coffee from Five Senses at the moment - its so fresh that its still vigorously degassing, so the palate is still a bit flat as well, but despite that the nose is amazing! It smells like a mixture of yeast flakes combined with some exotic fruit, and its very distinctive! Im guessing the the aroma will develop as well because its as I said only a few days post roast, but even so its bloody delicious! Haha Hakuna Matata... sounds awesome.. what a wonderful phrase! sounds like a winner - how many days post roast is it? Poured myself a "magic" with the Columbian Excelso, hadn't had one of those in awhile... I do believe I said afterwards... "That was magic!!!" hate the name love the coffee the name was made up by the baristas at St Ali in Melbourne and somehow it caught on - Im drinking Columbia Santa Maria at the moment from Montville Coffee and its bloody lovely ! I called it a 'magic johnson' at my cafe in melbourne coz i wanted to personalize it a bit! Was down to the last dregs of beans (9g or so), and thought, "Hmmmm.... could just brew this up filter style as usual... orrr I could whip out the ol single filter basket and single spout!" So... I did haha. Gave it a crack, and I was pleasantly surprised! About 8 grams in, yielded 19.5 grams out in 19s. A little fast so will go bit finer next time if the occasion arises hehe, but I WDT'd it, nutated it, really tried to get it packed in properly in the very strange single shot basket. Was quite nice! (Drank as an espresso) There was little to no body haha, was very light, had an almost tea-like texture, amazing aroma, nice sweetness, chocolatey. Not in your face at all. El Salvador El Roble Black Honey process. A new bean, and my first roast. Taken to the cusp of second crack. This is a chocolate bomb, with balanced acidity and very nice mouthfeel. Next few roasts will be lighter, as this would be as dark as I would recommend this bean, and I want more fruit flavours to shine. Ethiopian Yirgacheffe Hafursa. This coffee smells amazing. Butterscotch aromas and flavours throughout. Further resting will bring out the fruity notes. Easy to roast and a very sweet espresso. My first "Hafursa" coffee, and it is great. A 50/50 blend of the two has yielded a delicious chocolate honeycomb flavour that lingers in a milk drink. Amazing aftertaste. PM me when you're passing my way again.... I owe you a coffee or three missing you last time!! I’ve finally found a Sumatran that I like!! This is a very nice coffee from the Kokowagayo co-op. They’re essentially an NGO that are doing some great work in their part of Aceh with their collection of small holder members. They’ve already got a handful of certifications (including all the main ones), but more importantly are on the ground working to empower their female members as well as deliver whole heap of social development initiatives. Above all that the coffee is actually good!! Hallelujah! I’ve never found an Indonesian coffee that I really like. I’ve had moderate success with an FTO from Timor, but nothing else. Even the couple of washed Sulawesis I’ve tried have been average. But this one I like. It’s still wet hulled so does have some of the spicy sort of characteristics you’d expect from this processing method. What it does have though is a pleasant acidity and a decent amount of sweetness. I’ve actually mostly been enjoying it through the Aeropress, but as I just bought a V60 set up I thought I’d better give it a whirl. 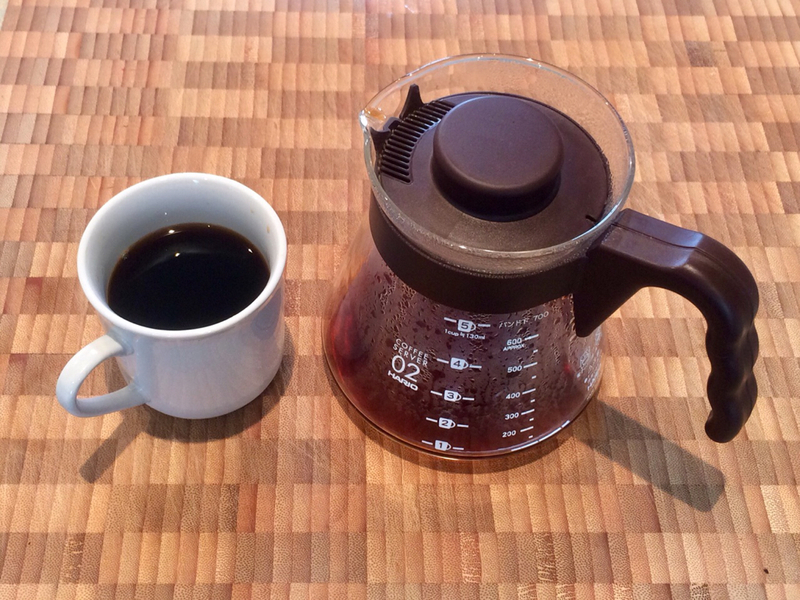 I roughly followed the Rao method, but I prefer a brew ratio of 1:12 for all my filter coffees. This came out very nice indeed.